Some of the advantages to McCullough Family home childcare is that we can offer everything that your child needs to learn in a preschool setting but with less children which means more one-on-one time and nurturing. Theresa and her staff make learning for children at this young age a fun and educational experience. My name is Theresa McCullough and I have successfully run a family childcare out of my home for the past 21 years. I have always enjoyed being around children. I was raised in a family of eight children in Ohio and went on to California where I married and have four children who are all grown now. My children all attended and graduated from Katherine Finchy Elementary, Raymond Cree Middle School and Palm Springs High School. I have obtained my AA degree in Early Childhood Education throughout the years just to keep up on anything new that may arise, learn new and fun things to do with the children, and it’s always a place where you meet amazing people to share in their experiences they have had with children. I also attend many workshops having to do with everything from new arts and craft ideas, to how to deal with children and the many situations that come up in their lives. The program that I run is play based with a preschool curriculum. I want to make sure that the children have as much fun as possible while learning. The children begin their day with a nutritional breakfast (Food program funded by the state) and then go on to the school room where they enjoy a preschool curriculum that consists of music, arts, crafts, storytime and games. We do all this while having fun. They also talk a lot about whats on their minds that day. We try and send home a list of songs that the children are learning each month and any work or projects that they have done that day. 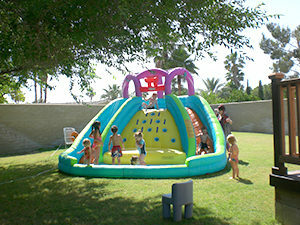 After they spend time inside, they go outside (big backyard, no pool) and just do what children love to do best, play. They learn a lot through play. It’s a chance to learn to share and get along with others. This is also where gross motor skills come in. They play a lot with balls, climbing on structures and riding scooters. Outside they also participate in play that involves bubbles, playdoh, painting, and in the summer we do water play. Clean-up and a nutritional lunch is then served followed by unwinding period and naps. After naps the children enjoy a nutritional snack, read books, play, or do homework (school-aged children) until they are picked up.